This week’s letter in the green-to-glam ideas challenge is ‘X’, and it is a special one indeed. First, because in the English alphabet ‘X’ has the least number of words beginning with it. Second, because it is the first letter of my first name: Xenya. A little while ago, I was extremely flattered to be recognized with the Sunshine Award by the 101 dress blog author Irina Markus, and I thank her very, very much! The rules for accepting the Sunshine Award include answering questions about yourself (full list of award criteria is below). Besides, today marks exactly six months since I started blogging, which seems like a perfect milestone to do away with some of my anonymity! So here we go, here are my answers about Xenya a.k.a. the Green Stilettos Girl! I’ve been a writer for most of my professional life but I’ve been somewhat hesitant to join the blogosphere. What inspired me in the end was a radio show about bloggers and aspiring writers, and that was my Aha! moment. My friends often call me “the environmentalist in stilettos” and that was my original plan for my blog name. But then my husband coined “green stilettos” and I was immediately smitten (and eternally grateful)! What is your favorite blog that you like to read? I don’t have one favorite blog, but a few that I enjoy reading on a regular basis. 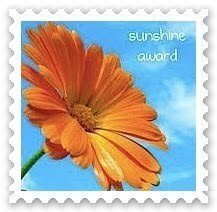 They are the ones I have nominated for the Sunshine Award below. It has got to be working with a major fashion brand in developing and communicating their sustainability strategy. If you could go anywhere for a week’s holiday where would it be? Somewhere I haven’t been before! Preferably warm and sunny. Up until a while ago I thought it would be insects, but I recently had a taste of my first insect appetizer. Which leaves snails. Definitely dark, minimum 70% cocoa content, and in particular orange flavoured. Never enough it seems! For now I’ve decided to stick to one post per week, which is just about manageable with a full-time job and two children under the age of five. Do you watch TV – if so what are some of your favourite TV shows? I’d take a costume drama any day! Giardinoblublog – aestethically pleasing and ethically rigourous organic jewellery. iScream by Laura van der Vorst – love her fresh and personal take on sustainability. Manner of Speaking by acclaimed public speaker and fellow Toastmaster John Zimmer. Style Is by Ceri Heathcote – seriously stylish and seriously sustainable resource from the UK. Stylish Solution by Elle – amazing DYI ideas for unleashing one’s creativity. ThreadGently by Emma Tynan – thoughtful, classy, lovely take on sustainable fashion. Triple Pundit – the ultimate authority on the triple bottom line! Urban Accents by Claire & Sarah – a breath of stylish fresh air on the shores of Lake Geneva. Warrior Writers by Kristen Lamb – a must-read for all aspiring writers, including yours truly. Include the logo of award in the post or put it on your page.